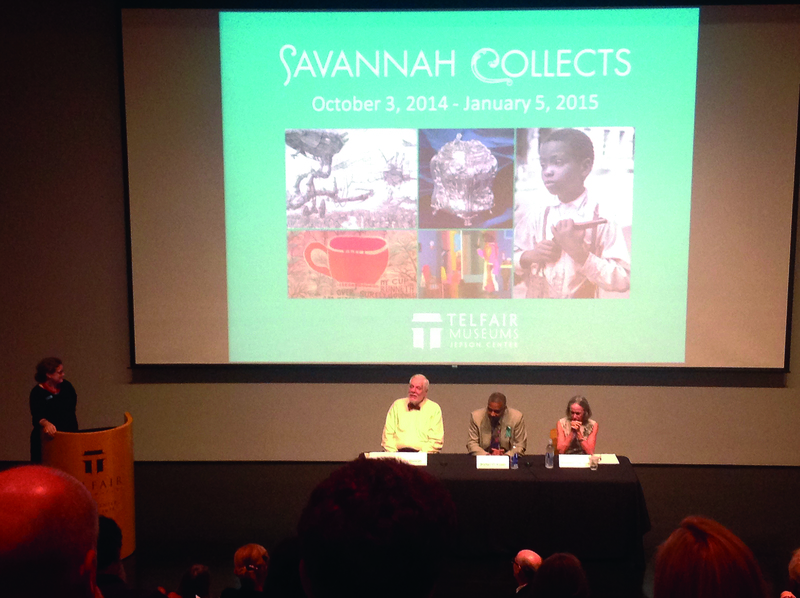 Collectors answer questions during Savannah Collects lecture. The Jepson museum invited three collectors to discuss the craft of collecting art on Oct. 2. John Duncan, Walter O. Evans and Eleanore de Sole shared how they became collectors and answered questions from the audience. Telfair Museums Director and CEO Lisa Grove, said the “Savannah Collects” exhibition is about “emphasizing the importance of collecting. . . and living with works of art.” The exhibition contains pieces from various local collectors that span across different time periods, styles and media. The event was held in the Neisse Auditorium and John Duncan was the first collector to speak. Duncan collects historical maps and drawings. Even as a child he collected various things from pennies to books. He found a daguerreotype of President John Adams. Later he learned that it was the first photograph of a U.S. President. Duncan, a native of Charleston, South Carolina is a former Armstrong professor. His collection includes work by local artists Christopher Murphy Jr. and Myrtle Jones, as well as historical maps that are currently on view in city hall. “My collecting is a sickness and I hope and trust I will never be cured,” Duncan said. Dr. Walter O. Evans was the next collector to speak. He was born in Savannah, but did not grow up around art. His interest in art began when he went on a date to a museum. As he traveled to different museums in the U.S. and other countries, he noticed a lack of African American art and decided to focus on this type of art. Evans’ collection includes African American art and literature from the 19th century to contemporary work. While working with the Detroit Institute of Arts he arranged for two artists to stay at his home every year. Evans knew the famous painter, Romare Bearden. Bearden’s Summer Star is included in the exhibition. Evans told a story about how he missed a chance to buy Bearden’s The Piano Lesson before the play of the same name by August Wilson was released. Bearden’s widow Nanette Rohan later sold the painting to Evans. When asked which work is his favorite, Evans said they all have significant meaning to him. “They’re all my children and I don’t have a favorite child,” he said. Eleanore de Sole was the final collector to speak. Like Dr. Evans, she was born in Savannah and did not have a background in art. She began collecting art with her husband. They both have a passion for sailing and collected paintings of boats and ships. They decided to focus on modern and contemporary Italian artists after they moved to Italy. They went to auctions and art fairs to learn more about Italian art. She said the one common thread with every piece in their collection is that both her and her husband have to love the work. Their focus is not on money or how famous the artist is, but on the connection they have with the piece. “It was different from what I thought it would be,” lecture attendee Nancy Rosenthal said. “I was glad to hear the stories of the collectors who were not exposed to art,” Jay Weidner of Beaufort, South Carolina said. He enjoyed hearing how they educated themselves about artists and their techniques. Weidner is also a collector and focuses on 19th century English ceramics. He said a good way to start being a collector is by coming to museums and learning more about art and artists from exhibits and books. “You never quit learning,” he said. After the show, visitors went into the Kirk Varnedoe Gallery to view the exhibit. Notable pieces include “Savannah Market” by Harry Hoffman from the Robert and Alice Jepson collection, “Pink and Green Mountains” by Georgia O’Keffee from the Betty Melaver collection, and “Ghost Station” by Ed Ruscha from the Dwight Emanuelson collection. The exhibit is open until January 18. Student admission into the Jepson is $5 with a school ID. The first Friday of every month is free from 1p.m. to 4 p.m.
Don’t I wish Ms. Bearden gave “Piano Lesson” to me. In fact, it was sold to me for several times more than when I originally attempted to purchase it.